I keep finding these old posts that were hiding in the drafts, so here’s something new for you, even though Chloe took those steps such a long time ago! As I watch Chloe take her first not-so-tentative steps, I think about baby steps and how they are the building block for so many things in our lives. We use the term so frequently yet it has not been until very recently that I’ve seen the literal baby steps in action. Small, but filled with excitement, ever pushing her onto the next step. Before I know it, she’ll take off without our help, and soon after that she’ll be running all over the place. With the innocence of childhood, it’s fun to watch her take those steps with some fear, but mostly excitement about this new adventure. As I try to take my own baby steps in my life, I know that I can’t change everything overnight. I need patience and the knowledge that it takes time, and baby steps, to make lasting change. I am here to help support you as you make changes in your life towards whatever makes you feel like you are living a sacred life, and to make these shifts feel easy and accessible. Here are some tips that you can start implementing in your life today to start on your journey to lasting change. Start making lateral shifts – Changing habits can be difficult, and when there are things in our life that we want to change but have become so used to, it can be especially challenging. Instead of cutting something out of your life and feeling deprived, add something in that would fill that space. For example, if you have been thinking about cutting soda out of your daily habits but you can’t imagine getting by without that carbonated beverage, try a carbonated fruit juice (like Izze) in place of the soda. Try a new food — Healthy eating doesn’t need to be about cleaning out your kitchen and starting over with foods you’ve never tried. New can be fun and exciting. Pick 1 new food each week and see how you can incorporate it into one of your favorite meals. This can be as simple as adding a new vegetable to a favorite dish. Over the years, I have finally gotten over the false sense that I didn’t like certain foods – it’s opened me up to a world of peppers, artichokes, brussel sprouts, and so much more. These are foods that I never would have imagined that I would eat, but now they are some of my favorites. Slow Down — Make time for yourself. This can be one of the hardest changes to make. We are so used to running around at such a fast pace that we often lose sight of our need to recharge. If you bring some awareness to the tasks are part of your everyday routine, you can find some space for yourself. Try walking at a slower pace, try eating more mindfully, try speaking more slowly and clearly and see how that makes you feel. Remember, take baby steps. What can you do today to support yourself more? Pick one thing at a time, experiment, and have fun with it! This entry was posted in General Wellness on February 1, 2016 by Xandra. As I was looking through old posts, I found this one hanging out in drafts. Who knows why I never published it. Maybe I was going to add more to it or I got distracted by something. I decided to share it now because the advice is solid and maybe it’s just what you’re looking for today. Here are a few tips to keep in mind. They are applicable to everyone at any point in time, but especially relevant to those of you who are on the journey to mamahood. Preconception: Keep it slow and simple. Don’t let yourself get overwhelmed like I did by all the changes you want to make before you get pregnant. Start making some shifts in the way you think and approach food and wellness and let things happen at a natural pace. If you know you need to be drinking more water, start there because it is so easy to do but it will have an amazing impact on your energy and overall health very quickly. Set a few simple goals and get yourself comfortable with the mindset that change is a process, not an overnight event. Pregnancy: Relax. With the anticipation of the responsibility of parenthood and the fears that inevitably come with that, it is easy to feel overwhelmed and anxious during pregnancy. Remind yourself that you are doing the best you can for your baby, and that is perfect. Take control of the things that you can (such as eating habits, what products you use, etc) and start to let go of the rest. We can’t protect our children from everything in the world, and we’ll drive ourselves crazy if we try. Knowing that staying calm will help you best care for your baby is great motivation to relax. Postpartum: Accept help. This time of year often finds us surrounded by family and friends. This can sometimes be overwhelming, especially if you are exhausted but you can use it to your advantage. Let others take care of the baby so you can get a plate of food, catch up with people you haven’t seen for a while, or even sneak away for a quick nap. Let friends and family support you with these moments for yourself, and try to release control and worry for these pockets of time, however brief they may be. This entry was posted in General Wellness, Pregnancy, Sacred Mama on January 27, 2016 by Xandra. The ocean stretches forward to kiss my toes. Old friends and strangers at the same time. The water that reaches the shore has never touched before that moment. Those toes have traveled far and wide since the last visit and the being inside is an altogether different iteration of me. Me. This idea of self that we carry as if we are ever one and unchanging. You are as many as the drops in the ocean. You change as frequently as the water that rises and crashes to the shore. So why do you continue to berate yourself for who you are? Why do you come again and again with judgement and criticism? Can you fill that space with the love you find when you look out at the vast water in amazement? Can you find amazement for your being, for this moment of self? The ocean. We return again and again to its shores and see it for what it is as a whole – the ocean. And yet, every piece of that ocean is something new. Each drop of water. Each creature that calls it home. You return again and again and see yourself as this whole. Yet you overlook all the strength your past has given you. You lose sight of the parts of you that have grown and flourished and become. Cherish yourself as sacred and magnificent just like the ocean. For you are. Be the old friend and stranger at the same time. Dancing beautifully the line between all that has been and all that is yet to come. This entry was posted in General Wellness, poetry on September 15, 2015 by Xandra. 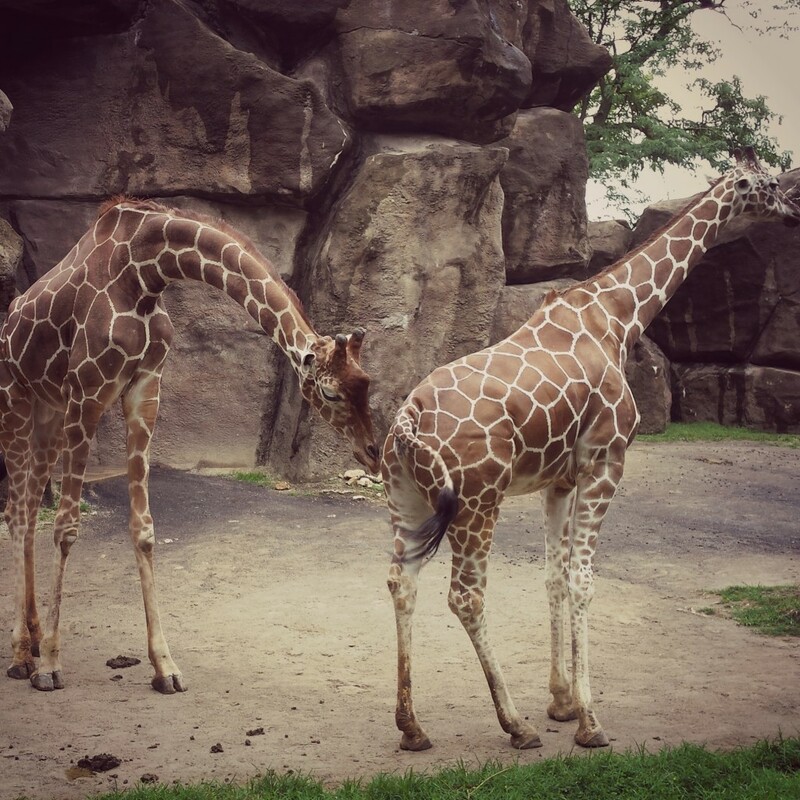 We stood there and watched the male giraffe sniff the female’s behind and then drink her pee. I knew there must have been a reason for it, and when I discovered what it was, I was amazed (and not all that surprised). In the wild, male giraffes will taste the female’s urine to tell if she is in heat, and if so, they will continue the mating ritual. That is genius, that giraffes have evolved to be able to identify signs of fertility in potential mates. This experience coupled with my recent (and much overdue) reading of Taking Charge of Your Fertility (a must read for every woman who desires to better understand her body), made me think again about how much we have distanced ourselves from knowing our own bodies, and therefore our deeper selves. We have the fertility signs, and our mates do not even have to drink our urine (I think we’re all grateful for that). This is true when it comes to our creative fertility as well. In the age of reliance on technology to remember information for us, tell us how to get from point A to point B, and so many more of the simple day-to-day tasks that we used to do without such dependency, owe have distanced ourselves from the most important thing of all – ourselves. In many ways, I think we have become afraid of turning inward and looking for the messages that will give us more information than any app or website ever could. I believe this fear comes from a growing lack of trust in ourselves. Trust is built when we feel safe, when we can expect reliability, when we can put down our armor and be our true selves. I asked a few friends how they know when to trust a person or a situation. My gut. And I have no questions about it….When I trust it just is. …when someone earns your trust, you really feed heard by them. I ask my guides and I get clear answers. Trust is the ability to no longer question. You’re never going to get that kind of feeling of trust when relying on your phone’s GPS to tell you where to go or by looking something up on a website. The trust that these women speak of is the internal trust compass that we all have within us. The giraffes have this kind of trust. They know the signs to look for, they know how to gather the necessary information, and they know how to interpret the data. Then from a place of trust, they can choose their path. When you take the time and awareness to listen to the messages that are waiting deep within, you cultivate a deeper trust with that inner knowing. Then, you know what step is next on your path. Then, you not only know what questions to ask but how much faith you have in the answers you recieve. Then, you have created fertile ground that is rooted deep within. This entry was posted in General Wellness on July 14, 2015 by Xandra. The waves washed over my feet and I felt a strength I did not feel when I last let the ocean kiss my feet. Yes, something in the last year shifted deep within me and I could feel an unwavering confidence which I do not usually associate with the ocean. I enjoy being by the water, breathing in the air and opening my ears and soul to the sounds of the waves. Being in the water has never been a place of comfort for me. This day, all I wanted was to be in the water. Every time I walked away, it beckoned me back and I have to believe that it is a sign that I have cultivated an inner strength that felt weaker a year ago. I have grown, and this is how I was able to see that growth that is so often intangible. This shows up in my yoga asana practice as well. A few weeks ago I was standing in my kitchen and suddenly found myself in Natarajasana. Coming into a yoga pose in a place as unsuspecting as my kitchen is quite normal for me (the other day I fit in a full 30 minutes of yin in my mother-in-law’s living room while we were hanging out). What took me by surprise was the strong desire to take a shape I typically shy away from. Natarajasana, for whatever reason, is one that my mind has programmed me to believe I do not like. When we can trust our bodies more than our minds they will lead us to what we need. Natarajasana evokes strength and power to me. Finding our strength while balancing on one leg, while stretching ourselves out in both directions, while creating circuits of energy between our hand and our foot as well as our fingers as they connect in jnana mudra. It necessitates taking up space, trusting that we can remain semi-still as the world keeps moving around us, believing in our own power, and knowing that we have all we need contained within us. Maybe that day in the kitchen was a moment of Tarot-Yoga for me. Maybe I pulled that pose from somewhere deep within because I needed the medicine of what it had to offer me. What do you know deep within you need? What might it unlock when you allow for it? This entry was posted in General Wellness, Yoga on June 15, 2015 by Xandra. This entry was posted in General Wellness, Sunday Morning Special: Poetry Growing the Light Fantastic on December 1, 2014 by Xandra. What warms you when your soul is freezing in the depths of winter? What save you when your soul is lost in the wilderness of life? What hears you when your soul’s voice can barely manage a whisper? It’s you my dear, always you. Your soul is wrapped in the warm blanket of an eternal love burning brightly within. Your soul is guided by an inner compass that will always know the way. – you, the infinite Universe, one and the same. Take heart my dear, on these cold lost mornings of the soul. even when the faintest ember can barely be seen. 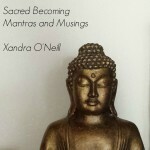 This entry was posted in General Wellness on November 23, 2014 by Xandra. When I was growing up, we spent lots of time doing jigsaw puzzles. I always liked to start with the border; I think it made me feel safe as it created a boundary. I often referred to the box to see what went where because I liked to have a plan. My father, on the other hand, rarely looked to see what the full picture looked like. He trusted in his ability to find the pieces that went together and slowly build the puzzle. Life, like a puzzle, is finite, though unlike a puzzle, we can’t see the borders and we usually don’t know what the picture is going to look like even when we think we do. As I sat down to explore this more and share with you, I realized that life is more like a painting – the canvas, like the border of a puzzle, gives a finite space in which to explore and work. With a painting, you get to create, recreate, layer and change over time. That’s what you get to do with your life too. Some choices that are made are done consciously and with excitement. Other times, life brings us challenges that necessitate us thinking about new ways to approach a situation. No matter what appears on the canvas of your life, the light and the darkness, you have the power to create anew in each and every moment. You can take a ‘mistake’ and create something beautiful from it. You can let the paint dry, the situation settle, and decide what your next steps will be. That’s one of the magical things about life – we are constantly shifting. When we listen to the lessons that life gives us, these shifts bring us closer to our true selves, to what we value most in life. And there’s no need to fear getting it wrong because it changes. What you wanted and believed and lived in the past does not need to define your story now, nor does your now need to define your future. This moment is where you get to step into your sacred and authentic self. Tomorrow, maybe you wipe the canvas clean and start again or add a new layer on top of what is already there. Breathe into this moment, find gratitude for it, step back and look at the beauty that is the painting of your life right now. This entry was posted in General Wellness and tagged awareness, gratitude, practice, trust on November 20, 2014 by Xandra. The door opened and the wind swept in, lifting the balloon out of my sweet girl’s gentle grasp and up up and away before she could even comprehend what was happening. Sometimes we hold onto things for fear of losing them, and in a moment of distraction, we let go and they are gone. The tears come, we find ourselves in sorrow, and we might even convince ourselves that things will never be the same. It’s true, they won’t be, and that’s often such a gift when we can be open to receiving it. When an outside force plays a part in leading you to let go, it can be a relief. You didn’t have to choose. You didn’t have to think and think and over think. You didn’t have to be attached to your decision. Sometimes we let go of a dream because we’re tired, or we’ve grown into something new, or because someone has taken it from us. No matter what has led to the letting go, it is in letting go that you get to plant new seeds and grow. That can be crazy exciting. And terrifying. It requires a strength and sense of self-trust that I believe we all have. You might not be consciously aware of it in the moments when you feel terrified, but I promise that you’ve got it in you. My hope is to help coax that spirit of yours to life so that you can create all that you dream and desire. When you do, you’ll start to see the letting go as beautiful as a balloon floating through the sky. This entry was posted in Family, General Wellness, Preconception, Pregnancy and tagged awareness, simplicity, trust on November 13, 2014 by Xandra. Does Your Belly Feel Happy? “Start a conversation with your body,” my yoga teacher suggested when I asked a question about the meaning of where we hold tension in our body and why balance comes easier on one side rather than the other at times. “Does your belly feel happy?” A question I overheard a mama ask her son in a coffee shop. I love that she asked him this! It’s the self inquiry that we so often shy away from, as if we fear what messages we’ll uncover. When you begin to tune in and listen to your body wisdom, you learn so much about yourself, and life starts to shift into place with a little more ease. When I’m in pigeon pose in yoga class and I notice that my left hip feels more filled with tension I can make a mental note to go online and look up what energy held in the hips represents and see if it resonates with me. Or I can breathe into that space and notice what comes up for me in that moment. There was one point in time a few years ago where a very specific situation filled me with emotion while in pigeon pose and I found myself realizing, “Oh, that’s where I hold all of that energy.” From that awareness, I could breathe into it and begin to release it with compassion. The same goes for figuring out how to nourish your body in the way it desires. You can fill it with junk or with the healthiest of food but if it’s not what your body is asking for, it’s not going to land well. Sometimes bread makes my belly feel full and unhappy. Sometimes yogurt brings a rash back to my underarm. Sometimes coffee makes me jittery. So I back away from them. Sometimes a salad just doesn’t do it for me. Sometimes a croissant is exactly what my body wants. Sometimes yogurt and fruit is the perfect way to start the day. Sometimes coffee gives me focused energy. Sometimes those greens feel like the best gift in the world. So I enjoy them. I talked in a recent e-letter about how different our bodies are. They are different from each other, but perhaps more importantly, they are different moment to moment. When you listen to the messages of your body, you become open to the shifts and changes that are happening within, on a cellular level, and you can invite in that wisdom. What messages does your body have for you? Are you open to listening to them and learning from them? Please share in the comments below! This entry was posted in Food, General Wellness, Yoga and tagged awareness, ease, practice on November 3, 2014 by Xandra.